Here's a one of a kind show! Local Legend Malcolm Tent is sharing a bill at Molten Java playing his special brand of acoustic punk rock with Emcee M.D. performing some old school hiphop. I doubt this type of bill has ever happened in the state so you owe it to yourself to check this out! There is no explaining Malcolm Tent. His history and credits will no doubt fill some immense book after years and years. 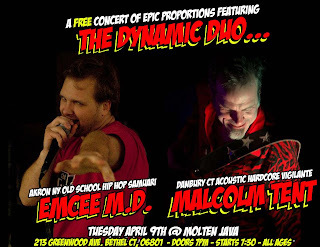 Malcolm currently plays solo acoustic punk rock songs that he has written, part witty comedy, part social criticism.